When I was learning about dependent and independent variables in experimentation, I had the hardest time remember which was which. To this day I have to take a moment to make sure I’m describing or graphing something correctly. At the age of 39, and as a practicing engineer, I still have a bit of trouble with this. I blame this on poor teaching, or poor learning1 but I have found the best graph to simplify everything! Jessica Hagy does wonderful and funny index card graphs and diagrams at her blog Indexed. This one perfectly teaches where the variables need to go (although it doesn’t help with remembering what is independent and what is dependent). As the number of Chihuahuas go up, the number of Eagles go down, obviously due to rampant little yappy-dogs armed with stinger missiles. As the number of Eagles go up, the number of Chihuahuas go down, due to eagles eating the yappy things. One of those items is wrong and one is right. 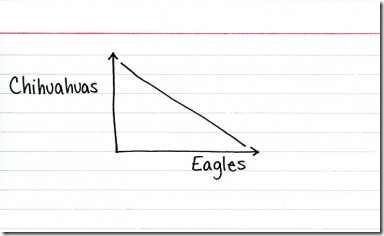 If you can remember the way that graph is drawn, you now have the perfect mnemonic because I don’t think you’ll need a reminder that Eagles eat Chihuahuas, rather than vice versa. I will haul this out the next time I have to explain dependence to someone. Hope you and Jenn are doing well. Love the graph. I’ve just subscribed to the Indexed blog as a result. Thanks for sharing and take care!